The topic this week for Homeschool Memoirs is what's new in the way of curriculum in our house. We gone to a little bit of a less "structured" curriculum and are doing more of a unit study approach this year. This curriculum is geared for K-3/4th graders and while it involves a little more planning on my part (chosing which day to do things, etc. 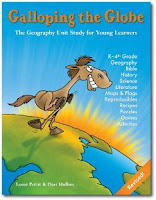 ), it offers great ideas and resources for each country that is studied. This is not an exhaustive study of every country of the world, but includes the major countries. For our current school year, we will be studying the countries of China, Korea, Japan, India, Israel, Antarctica, the Arctic, Russia, Great Britain, France, Italy, Germany, Holland, and Spain. Along with some of those countries we are working in lapbooks (i.e. China: pandas; Great Britain: sheep; India: tigers) which we are getting from Homeschool Share. Currently we are studying the countries of North and South Korea. We just wrapped up a 3 week study of China as well as a study on pandas, which I've posted about previously. The girls are loving what we've been doing, and I can say that I've been learning a lot myself! And when Mommy is having fun...well, the whole house is too! Hope you have great year. Sounds like such fun! Many years ago, we started out with strictly Abeka also. Though I feel it is a good curriculum, it is definitely more geared toward a school setting. My 4th grader still uses their math and language, but we have since filled in with a great variety of other things. I feel that A Beka has too much busy work too. I agree with Heidi that it is geared towards a Christian School setting. My kids learned from it while they were attending their CS. I enjoy the Science and Health books for the younger age levels, but we use it more as a guide book. I agree. That ABEKA is worksheet crazy. But it's designed for a traditional classroom teacher who needs to keep the other kids busy while she's working with a small group. It has great books, however! I'm so glad you posted about this book, I have been curious about it. Glad to see your crew has been liking it. The geography thing sounds like fun. You're couldn't choose more timely countries than North and South Korea, too, since Kim Jong Il apparently had a stroke, raising all sorts of questions about succession of power in North Korea. Your kids can learn about Korea from a history, geography, AND current events perspective. I love how you branched out. ABeka truly has a LOT of worksheets. It is working well so far although I think my daughter is doing far better than my son with it.